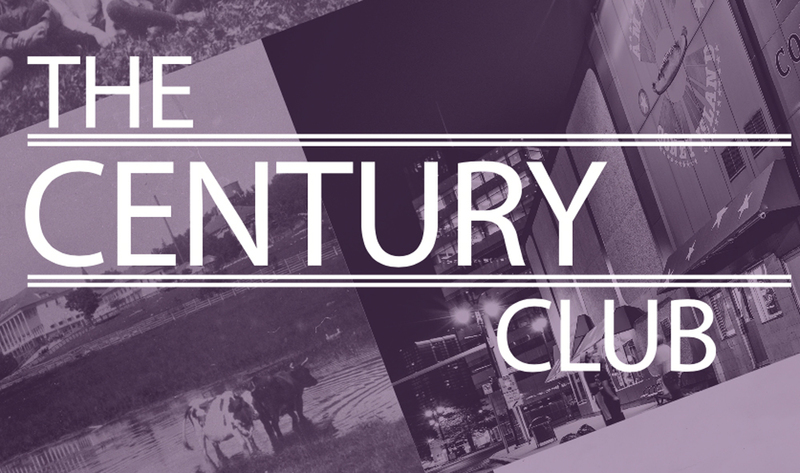 From banking and construction to education and restaurants, along with the Grand Hotel, DBusiness pays tribute to companies and organizations that are 100 or more years old. Gene Lovell, president and CEO of First State Bank in St. Clair Shores, maintains the institution has a ho-hum history, without much to distinguish its 101 years. But as he progresses further into describing the bank’s history, he admits there may be highlights worth noting, after all. Looking out the window of his third-floor office in the institution’s operations center, he talks about just how many people the community bank helped build and buy homes in Macomb County. Lovell also discusses the commercial side of his bank, remembering the many entrepreneurs who came calling for loans to fund their dreams and, ultimately, built thriving businesses. While it all might seem assured now, Lovell notes, success wasn’t always guaranteed. 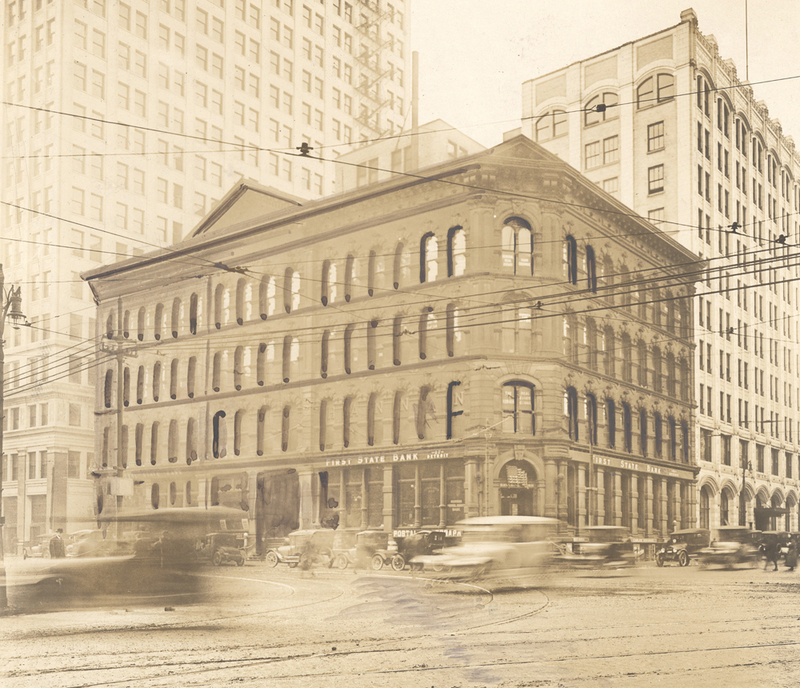 First State Bank opened its doors in 1917 at the corner of Griswold Street and Lafayette Boulevard in downtown Detroit. 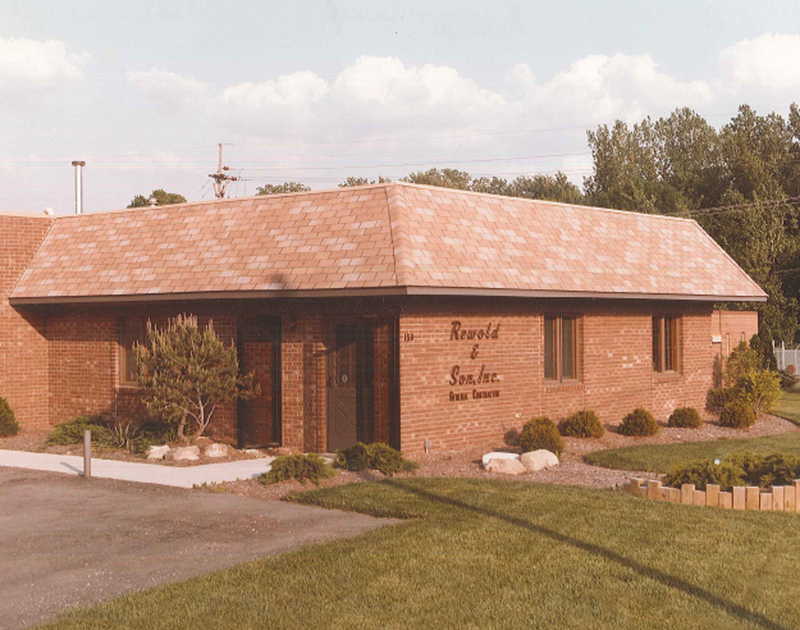 The bank eventually made its way to St. Clair Shores, where today the financial institution is run by President and CEO Gene Lovell. From its initial capitalization of $25,000, the bank has grown to include assets of $678 million, a loan portfolio of $465 million, and a Tier 1 ratio above 10 (a ratio of eight is considered well-capitalized). Lovell credits the bank’s conservative approach and liquidity for its survival not only during the recent recession, but also during the Great Depression, when many banks failed or were folded into other institutions. Such failures have continued over the decades, and some have been uncomfortably close to home: During the 1990s and early 2000s, 14 Macomb County-based community banks closed or disappeared via mergers and acquisitions, according to a 2010 Macomb Daily article. Only First State Bank and Community Central Bank of Mount Clemens remained. Regulators closed Community Central Bank in 2011, leaving First State Bank as the last surviving Macomb-based bank. As banking’s challenges have changed over the years, so has the industry’s technology. There was a time when one bank would literally walk a check it had just cashed over to the institution that issued it so they could be compensated for the amount. Lovell recalls when police had to direct traffic jams outside of bank branches on Fridays, when workers came to cash their paychecks. Today, that crunch is gone; more than half of all bank transactions take place electronically, without the need for a physical branch. Lovell says his bank is still expanding. 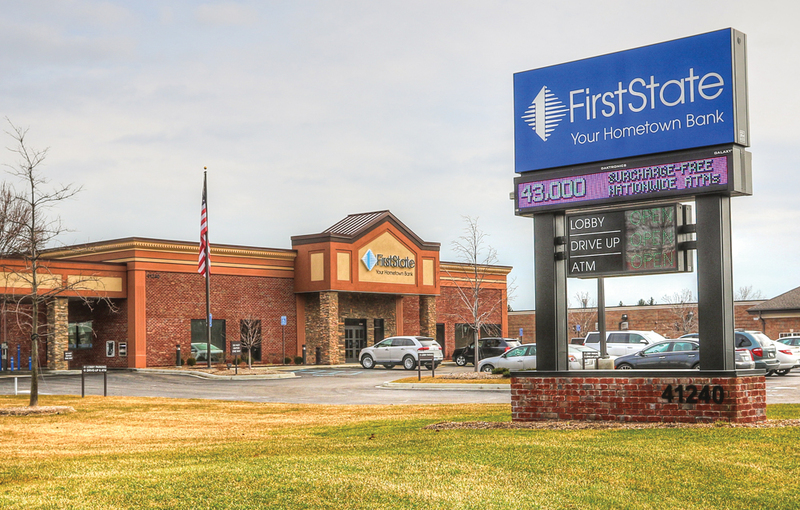 With 12 branches in Macomb County, First State Bank ventured into Oakland County in 2012, opening a mortgage office in Farmington Hills. The Farmington Hills location is slated to close, however, in favor of a location in Rochester, on property the bank acquired in December. 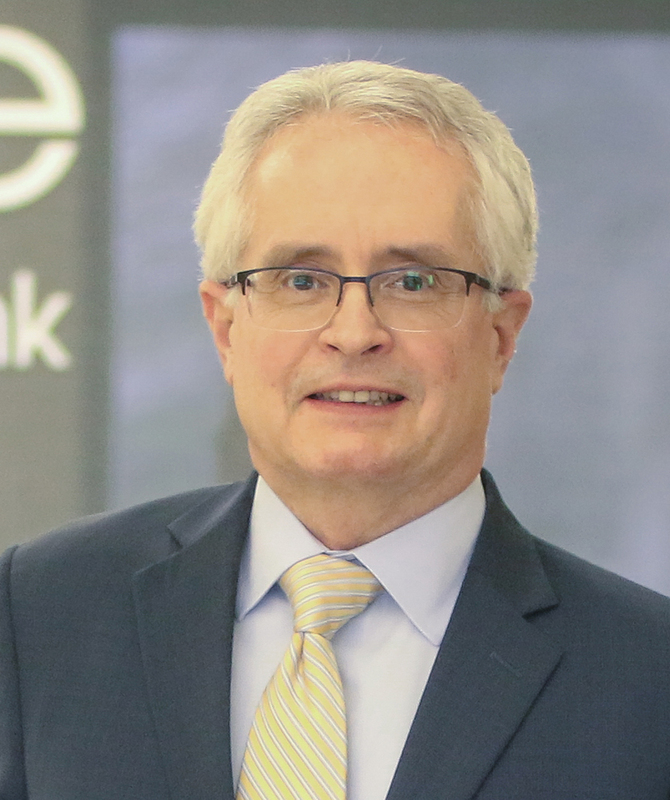 Even with all the challenges, Lovell makes a strong case for the kind of community banking his firm has long practiced. Frank Rewold and Sons Inc.
Frank Rewold and Sons Inc. have been a long mainstay in the Rochester market, where they have constructed hundreds of commercial, hospitality, and educational buildings. The company will move later this year into new offices from their current location above. An earlier office is shown below. Answers to how Frank Rewold and Sons in Rochester survived the Great Depression may be lost to institutional memory, but the 2008 global financial crisis remains vivid. Sales for the construction management and general contracting firm dropped by 30 percent, and profits dried up. One small misstep on a project could turn a break-even proposition into a loss. Payments and collections were difficult, and banks weren’t lending. The company’s billings of $150 million in 2017 are an anomaly — usually they’re in the $80 million to $120 million range, says Jason Rewold, a vice president and Frank’s son. A second son, Sean, plans to enter the family business after he completes a construction management degree at Western Michigan University in Kalamazoo. Daughter Ashley worked at the family business before training as a nurse; she says she’s eventually planning to return. In the meantime, the company is constructing a new, 45,000-square-foot office building across the Clinton River from its current home in Rochester, with plans to occupy part of the structure in time for its 100th birthday this year. Rewold’s largest project yet, a $70-million, 750-bed dorm at Oakland University in Auburn Hills, is underway. Other notable projects include the Royal Park Hotel in downtown Rochester, which Rewold owns and operates; Jimmy John’s Field in Utica; and renovations and additions at The Palace of Auburn Hills. Frank Rewold says it bothers him that The Palace closed last year. “I think there’s some things that can still happen there, and I’m working on that,” he says, declining to be more specific. The company’s history, along with that of Oakland University and the city of Rochester, are as intertwined as the roots of the trees along the Paint Creek and Clinton River trails near Rewold’s offices. Company founder Frank Rewold was a handyman and builder for Matilda Dodge and Alfred Wilson, whose Meadow Brook Hall in Rochester Hills helped establish the university following their deaths. Grandson Frank recalls visiting his grandfather’s office in the Shotwell Pavilion on the estate, a former horse barn that currently houses OU Inc., a SmartZone business incubator operated by the university. Jason Rewold estimates the company his great-grandfather founded has done work on every building at the university, most recently including timber replacement and tuck-pointing at the Tudor revival-style Meadow Brook Hall. “When we redid the golf course (Katke-Cousins) and some of the restrooms and outbuildings, we saw some initials from Roy and my great-grandfather from who knows when,” says Jason, referring to his grandfather, Roy Rewold. Roy entered the business in the 1940s, and in 1957 built Sunset Terrace, the Wilsons’ retirement dwelling and current home of the university president. 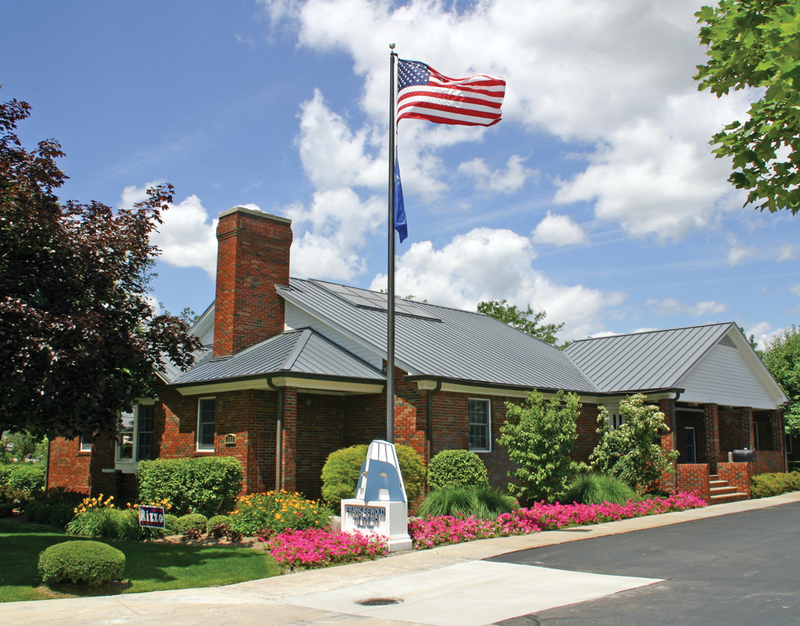 The company’s first two generations were a civic-minded pair; Frank Rewold was president of Rochester Village in 1953, while Roy Rewold served on the village council for 11 years, and was the last village president and its first mayor when Rochester became a city in 1967. “We have very strong ties in Rochester,” Frank says. Before his dad died in 2013, they counted about 100 projects the firm had completed in the city. Detroit Country Day School started in a kitchen and eventually occupied a building at Seven Mile and Wyoming roads in Detroit. Detroit Country Day School isn’t a family business, but Glen P. Shilling, its headmaster, has made it a family affair. His two children are affectionately referred to as “lifers” there, because they attended the school from kindergarten through 12th grade. His daughter married a fellow Country Day classmate, and today all seven of Shilling’s grandchildren attend the private college preparatory school. The seven Shilling grandchildren number three more than the school’s first class of four, who enrolled in 1914 at what was then Detroit Preparatory School in Detroit. Founder F. Alden Shaw taught the all-boys school in his mother’s kitchen at 680 W. Ferry Street. Twenty-six years later, girls were admitted into kindergarten through sixth grade; it wasn’t until 1972 that the upper school went co-ed. Shaw served as headmaster until 1961, then remained on the faculty until his death in 1979. By that time, the school had moved to the suburbs after operating in two other locations — one in Palmer Woods, and another on Seven Mile, near Wyoming. Today, the upper and middle schools are in Beverly Hills, and encompass grades six through 12; the lower and junior schools, for pre-kindergarten through the fifth grade, are in Bloomfield Township. Shilling had a prep period at the same time as Shaw, so the two men would often sit and talk. “I look back on that time of my life and I didn’t really appreciate it or understand it at the time, but I was sitting and talking with a man who was just brilliant in starting this little school in his mother’s kitchen (to provide) a classical education,” Shilling says. 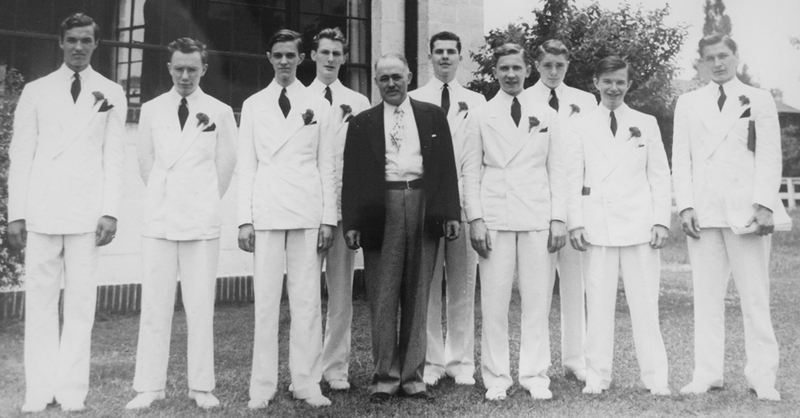 School founder F. Alden Shaw stands with a class of boys from the 1920s. More than a century later, the school is still raising money for infrastructure. Its current VIVID Capital Campaign is a multiyear, multi-campus project that includes $30 million in improvements, largely at the middle and lower schools. “We’re fully confident that we’ll be able to raise the dollars,” Shilling says. That’s a turnaround from the recent recession, when families with more than one child enrolled in the school were especially hard-hit. “To many of our families, tuition is the largest single factor in their economic lives,” Shilling says. Tuition ranges from about $10,000 a year for the half-day preschool to about $30,000 a year for the upper school. The institution also offers a financial aid program based on need and merit, and was able to call on that resource to help students stay in school during the economic downturn in 2008. “We weathered that storm, and they were so appreciative that many (of the beneficiaries) have become significant donors as the economy has recovered,” Shilling says. His knowledge of how the school fared during the Great Depression, when graduating classes could be counted on two hands, is unclear. “I’m sure, knowing the kind of person that Mr. Shaw was, they just did everything they could to make sure children were as minimally affected as could be,” Shilling says. Construction of the Grand Hotel was initiated by railroad owners and steamship line operators. The original hotel is shown below. The famous porch was designed by renowned architect Albert Kahn before he went on to found his own design practice. The white wood pillars were replaced over time, and were eventually supported by interior steel beams. Building the Grand Hotel was a feat that might stun the modern-day guests who rock in the chairs lining its front porch. The wood-frame structure was built in 93 days by an army of 600 men working around-the-clock shifts and living in tents on Mackinac Island’s shores. Builder Charles Caskey had never constructed anything approaching the size or complexity of the Grand Hotel; his previous jobs involved summer cottages. Lumber for the project, equivalent to 1.5 million board feet, had to be hauled by horses in the winter of 1886 across the iced-over Straits of Mackinac. The woodpile was so large, it could be seen from the mainland seven miles away. When the first guests arrived on July 10, 1887, they — not to mention the railroad and steamship line owners who had envisioned and invested in the project — had Caskey and his men to thank. Since that first day, owner Dan Musser III estimates 6.5 million lodgers — including Thomas Edison, Mark Twain, five presidents, Vladimir Putin, and entertainers like Rosemary Clooney — have checked into the Grand. Its current room count is 393.
Business boomed following World War II as pent-up demand fueled vacationers’ appetites for summer getaways. In a move that paid off during the 2008 global financial crisis, Musser diversified his bookings. 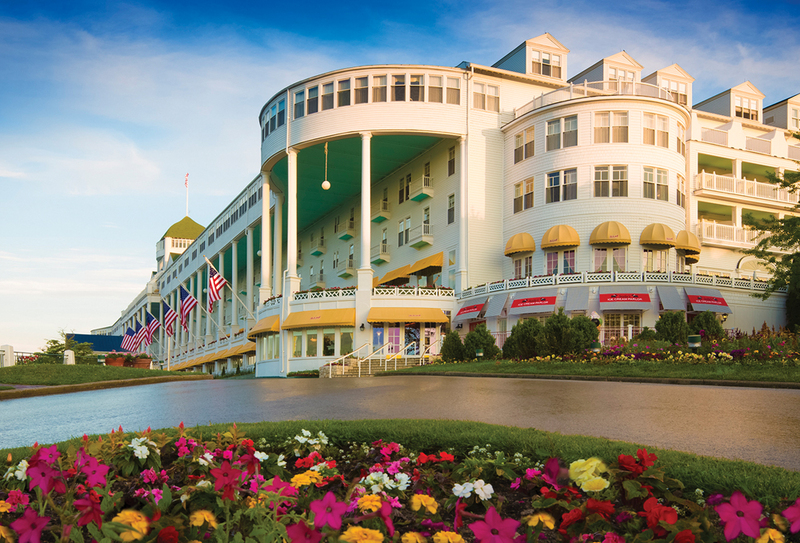 The Grand started pitching to new groups while working more closely with longtime accounts such as the Detroit Regional Chamber, which holds its annual Mackinac Policy Conference at the hotel just after Memorial Day. “That was one of the key groups that helped us get through the recession,” Musser says. Group bookings now account for half of the hotel’s business. The recession triggered other changes, as well. After the financial markets crashed in September 2008, the hotel couldn’t close its doors for the winter season fast enough. The following year, Musser and his staff came up with a plan to limit some menu items while reducing the restaurant’s hours. That plan paid off, too. “Financially, 2009 was good, but it was a hard year,” he says. A more frugal approach is now the norm for groups who like using the first-class facility but have to watch their pennies. Looking ahead to this year’s May 1 opening, Musser is redecorating two rooms, including one that will be added to a list of more than 40 rooms named to honor presidents, first ladies, actors, and other celebrities. The newest addition honors former Michigan Sen. and Rep. Prentiss Brown, who later in life chaired the Mackinac Bridge Authority, which oversaw construction of the span that links the Upper and Lower peninsulas. Brown also happens to be Musser’s wife’s grandfather. There’s a good chance the Grand Hotel will remain in the Musser family for another generation. He and his wife, Marlee Brown, a painter, have six children, and two have already worked at the hotel. The youngest are too little to work, so time will tell whether they develop an interest in the family business. Musser says he’d like to see his family extend the tradition that started with Woodfill, continued with his dad, R.D. Musser Jr., and now rests with him and his sister, Mimi Cunningham. “We’re thinking one of them should be interested,” he says. 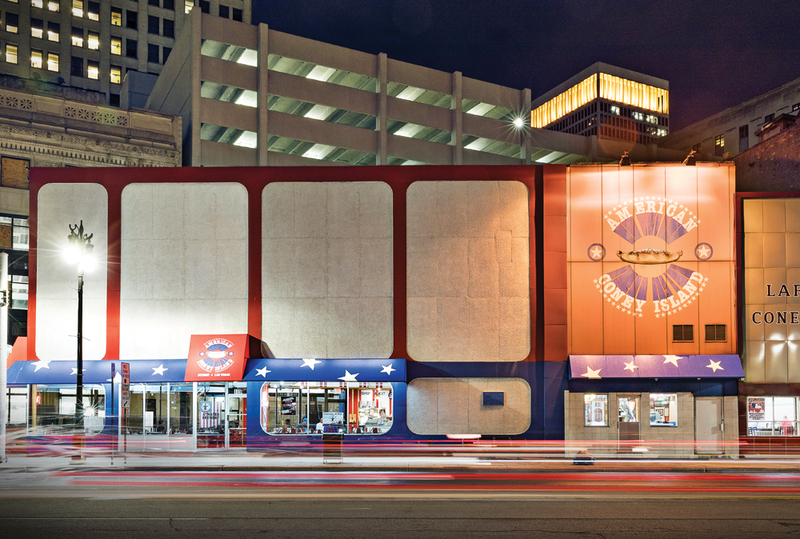 Open every day and late into the evening, American Coney Island has been a longtime fixture in downtown Detroit’s restaurant scene/ The famous triangle building is located at the convergence of Michigan Avenue, Lafayette Street, amd Griswold Street. Since its founding in 1917, American Coney Island has done much more than serve up hot dogs that are smothered in secret-recipe chili sauce, sprinkled with chopped sweet onion, and striped with yellow mustard. One of downtown Detroit’s most venerable quick food spots has also helped launch other, similar Coney chains and restaurants across southeast Michigan. Kerby’s Koney Island, Leo’s Coney Island, National Coney Island: the originators of each first earned their Coney “degrees” at American, says Grace Keros, the third-generation owner of the original, which was started by her grandfather, Constantine “Gust” Keros. That’s true even for American’s friendly archrival and next-door neighbor, Lafayette Coney Island, which was founded by Gust Keros’ brother. About 10 years ago, her brother, Chris Sotiropoulos, joined her. His arrival roughly coincided with the 2008 global financial crisis, which had a negligible effect on American’s business. Keros attributes that to American Coney Island’s affordable menu, its comfort food patina, and its destination status. She suspects it may have been the same during the Great Depression. Keros has come up with other smart expansion ideas, too. A dozen years ago, American began offering Coney kits through online orders and fundraisers. The online and fundraising kits are identical, and include all the makings for a dozen Coneys, minus the mustard. They even come with a paper hat, like the ones worn by the restaurant’s workers. American sells the fundraising kits to hundreds of schools, churches, youth organizations, and nonprofits. The online volume has reached a few thousand kits a year, which are shipped only within the United States. “Around the holidays, it always peaks,” Keros says.